“I think that it is imperative to teach and help the community in order to become the best we can be,” says Adrian Fuentes, a volunteer from the Heartland Worker’s Center (HWC). 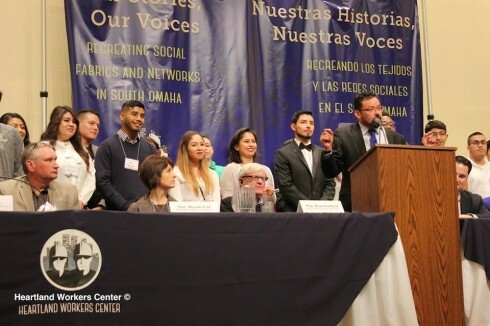 Fuentes volunteered at HWC’s first Latino political convention titled, Our Stories, Our Voices: Recreating Social Fabrics and Networks in South Omaha on Sunday November 8th at the Livestock Exchange building. According to the organization, over 300 community members, leaders and elected officials came together for the convention to discuss the future of South Omaha. “From the information given, and from personal experience, I think the Latino community has the potential and drive to achieve the goals we want; sure, we have several issues and lack of knowledge in several more, but that’s why this project is important,” says Fuentes. In fact, during the convention, the HWC released critical project information and unveiled a new four-pronged approach that will help community leaders understand the critical issues affecting South Omaha and will help engage new leaders that can create positive change. As a part of the project, the first area that the HWC focused on was analyzing the U.S Census data to develop a broad sense of the demographic and economic characteristics of the community. The second phase of the project is the community assessment that was conducted this year. The community assessment helps identify key social and economic issues affecting families in the area. According to Sergio Sosa, the Executive Director of the Heartland Worker’s Center, his organization canvassed in 8 different precincts in South Omaha as a part of the assessment. The HWC community assessment highlights a few key issues in South Omaha, some of these include low wages that don’t allow families to cover their housing expenses, lack of access to health insurance, childhood hunger and poverty, and barriers in education. In addition to these issues, the assessment also highlights that crime is a very important issue in the South Omaha Community and community members are interested in developing stronger relationships with key players in these areas so they can work together to create change. The third phase of the project includes leadership training and policy analysis that relate to the issues identified in the community survey. As a final step, HWC and community leaders will engage in civic and political activities at the local, regional and national level to improve the conditions for the people living in South Omaha. Sosa points out that he is very excited to have a lot of partners on the table that will help his organization create the much needed change in South Omaha. Sosa points out he counts on the support of local organizations like Justice for Our Neighbors Nebraska, Nebraska Appleseed and Catholic Charities and others. In addition to the support HWC is receiving from non-profits in the area, many elected officials in the area are also teaming up with the organization to see how they can help. Some of them include, Senator Heath Mello from Nebraska Legislature District 5 and Senator Nicole Fox District 7. Both senators represent South Omaha and their involvement will be critical.